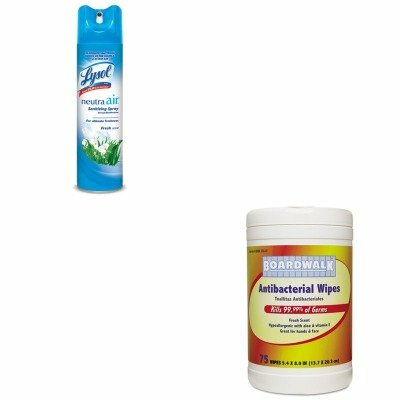 lt;stronggt;BWK358WEAlt;/stronggt;lt;BR/gt;Boardwalk Antibacterial Wipeslt;BR/gt;Kill 99.9% of germs that cause common illness. Non-linting wipe is soft and strong. Gentle aloe and vitamin E formula is alcohol-free and hypoallergenic. Dermatologist tested. Great for offices, restaurants, health clubs and any public area where germs can linger. Convenient, easy dispensing canister. Towel/Wipe Type: Wet Wipes Application: Body Washing Hand Washing Applicable Material: Skin.lt;BR/gt;lt;BR/gt;lt;stronggt;RAC76938EAlt;/stronggt;lt;BR/gt;Boardwalk Antibacterial Wipeslt;BR/gt;Solves odor problems not only in the air, but also at their source. Unlike air fresheners that only mask odors, this sanitizing spray eliminates tough odors such as smoke, food, mold, mildew, bathroom and pet odors. Leaves a clean, pleasant fragrance. Scent: Fresh Physical Form: Liquid Application: Odor Control Capacity Volume: N/A.